Though many see carburetors as magical contraptions that house all sorts of voodoo, a carburetor is essentially just a tube through which filtered air flows from the automobile’s air intake. Within this tube, there is a narrowing, or a venturi, where a vacuum is created. There is a small hole in the narrowing called a jet which is fed fuel via the float chamber. The float chamber is a container filled with an amount of fuel that is set by a float. The vacuum created in the venturi draws in fuel from the float chamber, which is at ambient pressure. 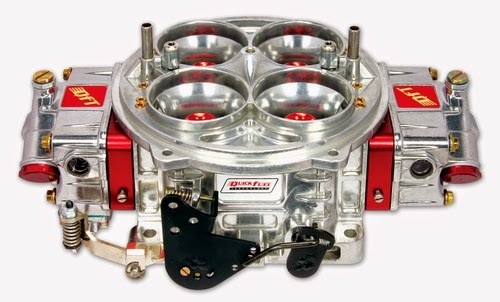 The faster the filtered air comes in through the carburetor throat, the lower the pressure in the venturi. This leads to a higher pressure difference between the venturi and the float chamber, and thus more fuel flows out of the jet and mixes with the airstream. Downstream of the jet, there is a throttle valve that opens when the accelerator pedal is engaged. This throttle valve restricts how much air enters the carburetor. If you push the gas pedal all the way down, the throttle valve opens fully, allowing air to flow more quickly through the carburetor, creating a bigger vacuum in the venturi, sending more fuel into the engine, creating more power. At idle, the throttle valve is fully shut, but there is an idling jet that bypasses the throttle valve and sends a set amount of fuel and air into the engine. Without an idling jet, the engine would shut off if the throttle were not activated by the driver during idle. What about that little lever you see in old cars? Well, that's the choke. The point of the choke is to provide the engine with a rich fuel mixture at start up. When you pull the choke lever, you close the choke valve and restrict the flow of air at the carburetor entrance. This makes the engine run rich. Once the car has warmed up, push the choke back in and let your engine shoot for that magic stoichiometric ratio. I'm getting to know a lot about engines with your post. That's something I haven't learned driving 8 years now. I don't know much about cars so this is added information for me. these are very helpful information! thanks! I love Physics,as I red the article I think I learning physics again. Thanks for this helpful information you've shared to us.